Real Estate, Interior, Architecture, Industrial Photography and Restaurants Industry all require gorgeous photographs of indoor or outdoor spaces to attract audiences. The most important thing of Interior and Real Estate Photography is to keep whites white, and make the space warm and inviting. Capture your home at the most beautiful time of day, beautiful sunset skies and soft lighting create an atmosphere that forges an emotional connection with potential buyers. We've created Interior and Architecture Lightroom Presets, Photoshop Actions and ACR Presets Collection to improve your indoor and outdoor photography and save you countless hours of frustration during editing. Interior design photography must be beautiful. But, it must also be accurate in its representation. In real estate sales, for example, authenticity matters significantly. Whether you are shooting the interior of a commercial, industrial, or residential space, achieving accuracy isn't just critical, it is tricky. Our Interior Design Photography Collection makes it much easier and faster to achieve perfect photography every time. The Collection includes Lightroom Presets, Photoshop Actions, and ACR Presets. Both amateur and professional photographers will find this collection essential to their work while interior designers, architects, and real estate agents (among others) will be thrilled with the results of your work. Accurate representation, especially as it relates to real estate or advertising, is a critical part of both commercial and residential photography. Getting it right can mean success or failure as it relates to your client's project and your reputation. Clarity, lighting, saturation, and balance can make the image of a room or space feel warm and inviting or cold and unattractive. If you are shooting pictures of a white kitchen, you need the image to show white, not beige. If the walls in a restaurant are red, you want red and not orange to appear in the photographs. As a photographer, your job is to create authentic images every time. We make it much easier to do with our comprehensive collection. You will improve the accuracy of your interior photography while avoiding unnecessary hours and a lot of frustration during your post-production editing. Using any of our meticulously designed and created actions or presets, you can ensure the accuracy you need. Light and dark matters greatly to all photography. A great interior architecture picture is often characterized by how well it uses light to its benefit - even when the effect is to convey a dark, moody space. However, the correct lighting in interior photography is often elusive. So, when ideal or natural light escapes you in your interior shots, our Lightroom and ACR presets can help you achieve what you want. The lack of natural light or over-reliance on your equipment doesn't have to mean poor quality photographs. You can correct for light during your post-production editing. You won't have to spend hours adjusting your light & dark balance or overall exposure. Our powerful Lightroom presets make it simple with a few clicks to make the most of your interior architecture images and to correct or enhance the lighting. You will be able to adjust light and exposure, tone, highlights, and balance on one image or multiple images at a time without sacrificing quality or spending hours. You can then save your adjustments for future photography, continue to use our presets, or do both! We also make it simple to create a signature look for your interior work. We bring our experience and skill to all of our presets and actions collection. These meticulously designed Photoshop Actions help you to make necessary adjustments and apply the desired effects characteristic of beautiful interior photography. You can save your work in your desired format using our cleverly-designed Photoshop Actions. Our BeArt tools make it possible to elevate the quality of your pictures to perfection during the post-production editing whether you're an amateur photographer or an experienced professional. We have designed them to be easy to use and convenient to install using our step by step instructions. Clarity translates as realism in photography while light and color create interest with their vibrant perfection. If you're off on these or other design elements, your photographs are no longer accurate representations. Without accuracy, you haven't done your job because a photographer must capture the personality of space through authentic representation. It doesn't have to be impersonal and unappealing. A skilled photographer knows how to create interest and even poignancy through the inanimate objects and architectural lines of a room. Sometimes they manage to do it during the photo session. In most cases, however, it's done in post-production editing. Otherwise bland pictures are edited to convey genuine depth and beauty - and, in some cases, emotion. Using BeArt's ACR and Lightroom presets, photographers can create exquisite interior design photography. It's not always possible to create the perfect picture while shooting. Our Lightroom Brushes means that with a few clicks, you can retouch your images to perfection during the editing process. Many of the designers at BeArt are photographers, and they understand the art and importance of fine art photography - whether it's done by an amateur or a professional. Our Lightroom Brushes will allow you to perfect your images to professional-quality every time. Lightroom Brushes allow you focus on those details your images need before you deliver them to clients. Editing and retouching will be simple, creative, and quick. Using our Lightroom brushes mean you can adjust any imbalances in colors, tone, eliminate blemishes in your image, and make other necessary adjustments. Interior photography might be challenging, but our post-production tools make perfect photography appear easy to achieve. 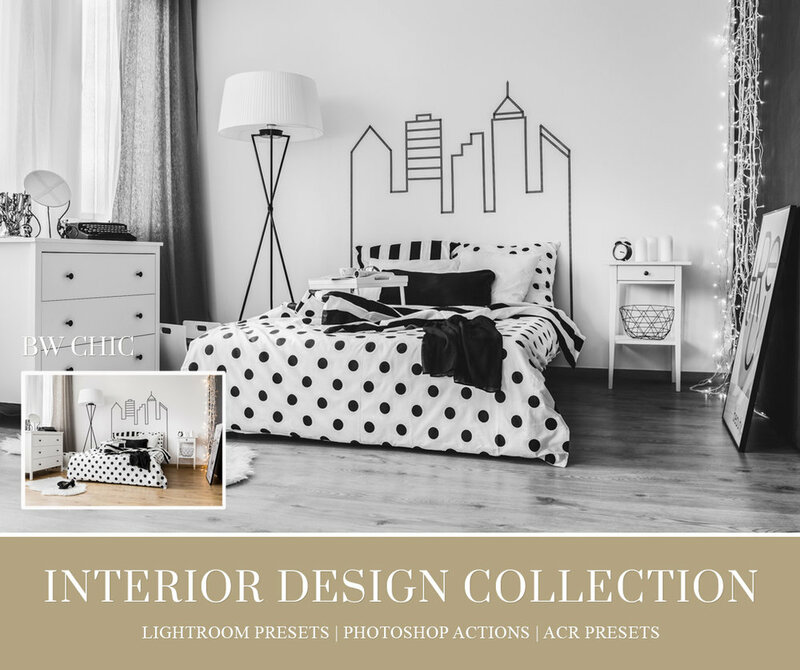 Our Interior Design Photography Collection of powerful tools lets you spend less time in post-production editing while delivering the highest quality images. You can devote more time to clients behind the camera rather than at the computer editing. Using our collection you will create images that are powerful, poignant, and vibrant using our Lightroom and ACR presets and Photoshop actions. Excellence is just a few clicks away.